The idea of monetizing comment sections by asking readers to pay to contribute or promote their comments might sound like a good idea. Michael Robertson, who founded MP3.com in the ’90s and, more recently, the comment management platform SolidOpinion, posits that such a move could solve two problems at once. Charging readers to leave a comment would introduce a new revenue stream for digital publishers as well as tackle one of the Internet’s most-longstanding problems: trolls. Last month, Tribune Publishing, the country’s third-biggest publisher and owner of the Chicago Tribune and the Los Angeles Times, began using SolidOpinion’s software on the San Diego Union-Tribune‘s website, as a replacement for its previous comment system operated by Facebook. SolidOpinion’s software is free for publishers to install and use, but it splits revenues from comments with publishers. To understand how paid comments might work, let’s go back a little further. The comment box is almost as old as online news. In its infancy, the remote connectivity of the Internet allowed strangers to click and communicate over common topics in the form of bulletin boards, forums, and chat boxes. When digital news publishers launched, such formats were integrated so users had a place to discuss the articles they read. Now, despite sophisticated technical upgrades to Internet infrastructure and digital media more generally, this arrangement has remained mostly untouched. But the relationship between news publishers and the people commenting is increasingly fraught thanks to the unfortunate tendency of some people to do and say terrible things when behind a screen. Like their fairy-tale namesakes, online trolls lurk below the bridge, spewing their vitriol to anyone who happens to scroll too far. Their messages are often rude, hyperbolic, misogynistic, bigoted, lacking in intellectual panache, and devoid of real linguistic sense. The challenges here are manifold. Removing comment sections shutters a potential community, off-loads conversation and traffic onto social media in a way that fractures discourse rather than collates it around a central news piece, and conveys a lack of interest in their readers. “Improving comments does not mean censorship or eliminating criticism,” the Guardian editors wrote, even though regular commenters (including the trolls) will inevitably argue that it does. Viewed in this light, an alternative market solution to trolling that allows the comment system to retain its original purpose seems like a good idea. 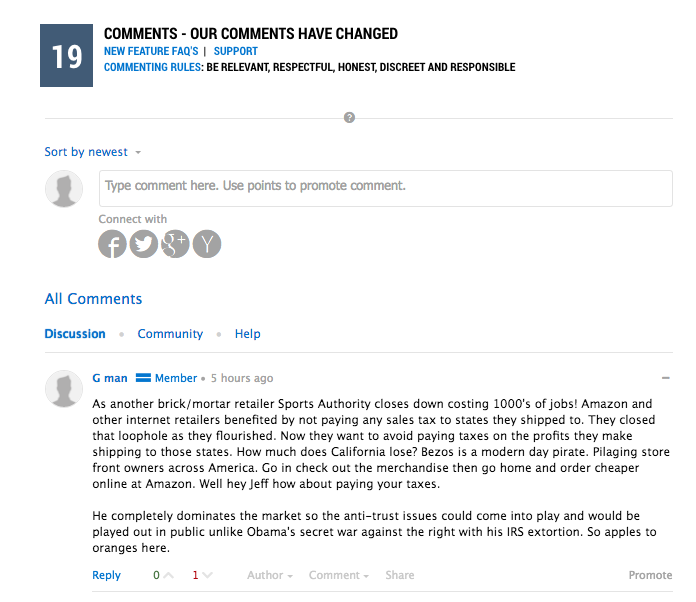 Under Robertson’s modular comment system, anyone can still leave a comment for free, but publishers have the option to charge readers to promote some of those comments to the top of the comments section. In each section, up to three promoted comments are shown. Readers can also buy top slots using points they get for positive interaction with the website, such as creating an account, making comments, or getting likes. They can also purchase points. The San Diego Union-Tribune‘s website, which charges 15 points for a promoted comment, sells 88 points for one dollar. But would promoted or paid-for comments really address the problem? Not only does it seem naïve to believe so, but asking readers to pay to be part of a conversation comes with its own issues. Not least of which is that it puts a price on the speech of readers and critics. A price barrier may force trolls away from their usual habits. But there are other solutions, ones that do not treat interested readers as grubstakes or disposable. SolidOpinion’s software could therefore be setting a dangerous precedent. Giving those with a disposable income greater control over digital real estate could alienate young voices, minority voices, and the voices of the disadvantaged. And it wouldn’t alone prevent vitriol or harassment. Nor would it stop the armies of paid commenters who already swarm the web on the behalf of political or corporate interests. Instead of fostering quality conversation, monetized comment sections may simply become havens for irremovable hate speech or ads, thinly veiled or not. Future comment sections could become a lively space for native advertising campaigns rather than thoughtful dialogue. The editors of the online magazine Tablet may be thankful for a reduced number of commenters on their site after adopting a strictly paid-for system, but the demographics of those who participate are unclear, as is how or whether the system has weeded out questionable comments—or simply pushed them to Facebook. Trolls are often act-before-think personalities. A price barrier may force them away from their usual habits. But there are other solutions—ones that do not treat interested readers as grubstakes or disposable. Various alternatives for improving comment systems have been proposed, like refusing to publish comments from anonymous accounts or verification processes that require commenters to prove they are human and to agree to abide by certain civility standards. Meanwhile, open-source tools are changing the way moderators review comments, while networks like Clapit and community management software like RebelMouse aggregate commentary from separate social feeds into a single place. Social media is being integrated into news sites to bolster engagement across platforms, and while this has its limitations, new aggregators might be able to overcome them too. The fact is the legacy format of the comment box is now flawed and outdated. We need to innovate it, not price people out of it. Pricing out the trolls may stop some of the vitriol but it does not solve the underlying issue. What we need now is real dialogue online, not less. To do that we need to reconsider the value of keeping legacy systems and formats in place. Software makers and publishers need to think outside the box, but that doesn’t mean excluding some and not others from commenting inside of it.